This weekend contained a mix of knocking things off the never ending "honey-do" list, and fun fall activities. From the soccer fields to fixing some of our landscaping to ending up running into Carrie Beth's family at our favorite apple orchard - it was a busy one. Not to mention this busy little bee turned eight months old this weekend as well. I feel like she was just born yesterday - how is she already eight months old?? And priority one this weekend was baby-proofing. Baby Cute has been on the move for quite sometime now. Every day she is one step closer to walking. She reminds me so much of Cute when he was this age - always wanting to be on the go and always on a mission to get on two feet as much as he could. I know I am going to blink and that tiny little baby of mine will be running across these floors. 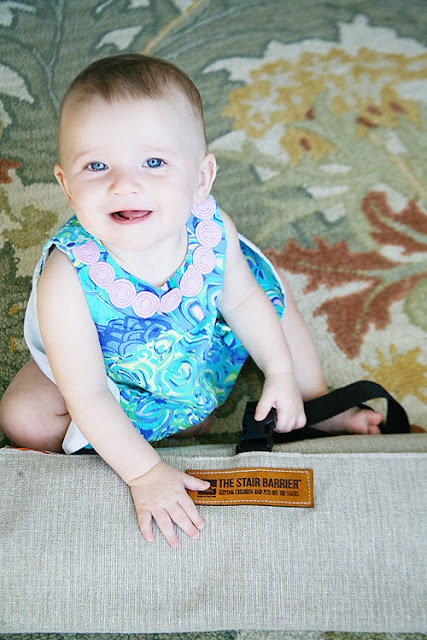 Baby proofing is one of those tasks that I know is necessary, but that I put off for as long as possible. Those big cumbersome gates and those squishy foamy things attached to every corner in your home - I just feel like it all deters from my whole home decor vision. Sure that vision might currently look like it was designed by a drunken mini human that recently had a major shopping spree at the local Toys 'R Us and ran around with a crayon or two in their hands, but still. Know what I don't see gracing the pages of the Pottery Barn catalog - a wonderfully decorated room complete with coffee table squishy edge guard or the latest in door hardware fashioning plastic knob protectors. But it couldn't be put off any longer. We live in a tough house to baby proof. We built this home before kids were in play and not once did it cross our minds how many little obstacles we were creating for ourselves and our little ones in the future. 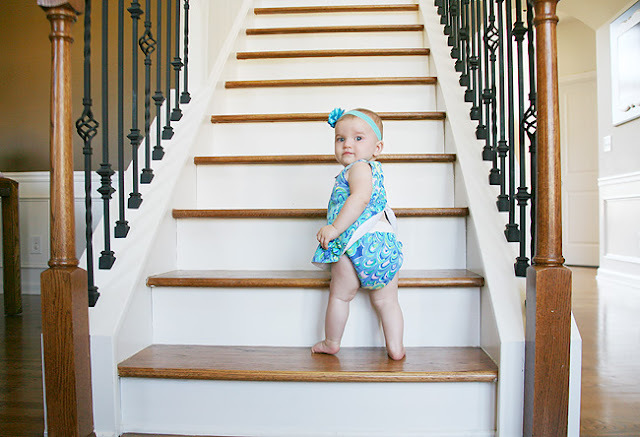 We have four different stair cases, all with different needs when it comes to attaching baby gates. It's been a challenge to say the least. 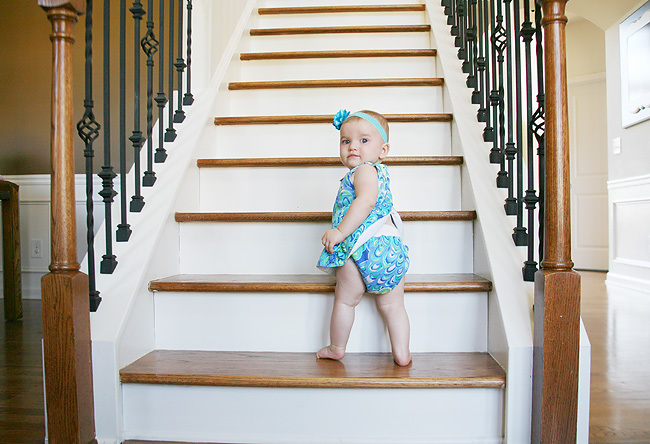 And Baby Cute has most definitely found her way to the stair cases. She crawl/walks her little self over to her favorite one (the one right by our front entry), and takes a little pause to make sure you are watching (or not watching). And in two seconds she makes her move. It doesn't take her long to make her way up, and it usually gives me a huge heart attack when she decides to take a peek back at you. She has yet to lose her balance, but still, her need to make sure you are watching her accomplishment sends my anxiety through the roof. We had some metal gates up with The Cutes, but they were tough to install and sometimes they fell, which wasn't kind to either the person they fell on or the floors. I was so excited when I learned of a local company in our area that distributes nationwide - The Stair Barrier. 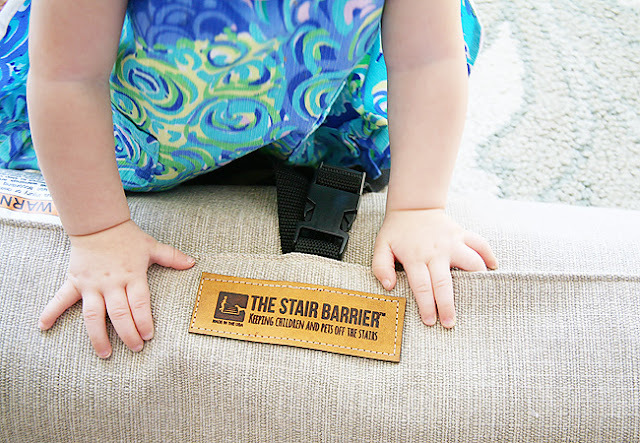 The Stair Barrier creates safety gates for babies and pets that are not only easy to install, but also take style into account. 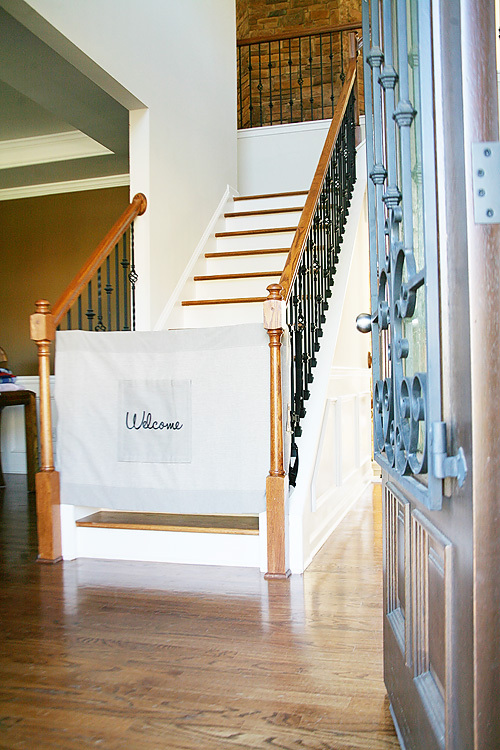 I loved that The Stair Barrier gates were easy to install as well as un-install when you needed. 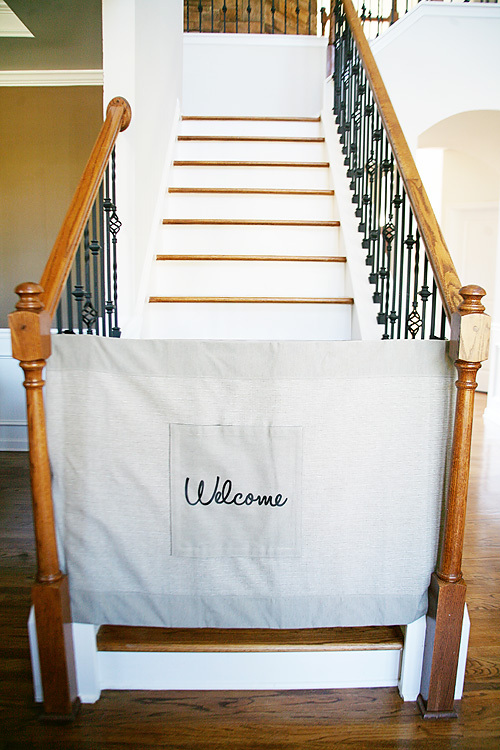 Whether we are moving furniture or hosting an event that wouldn't require gates, I liked the idea that I could roll it to the side or take it away with just a few easy clicks. 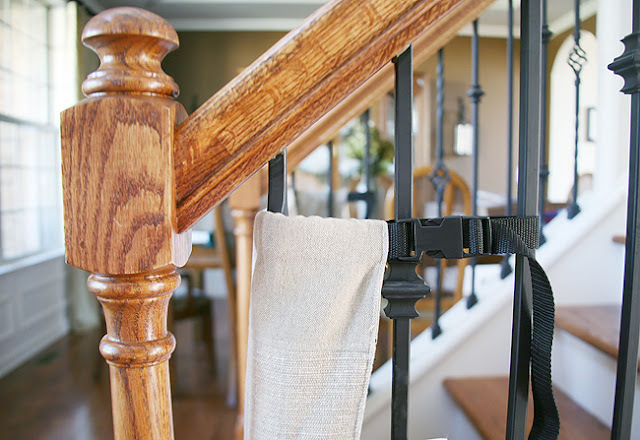 Not to mention they offer a wide variety of options - banister to banister, wall to banister, outdoor, and wall to wall options (coming soon!). After browsing through all the stylish options available, I opted to try the neutral khaki colored banister to banister option for my front stair case. I wanted to see how it worked first before buying the remaining three needed, and it is the first thing you see when you walk in my front door. One of my favorite things about The Stair Barrier is that it can also be personalized. 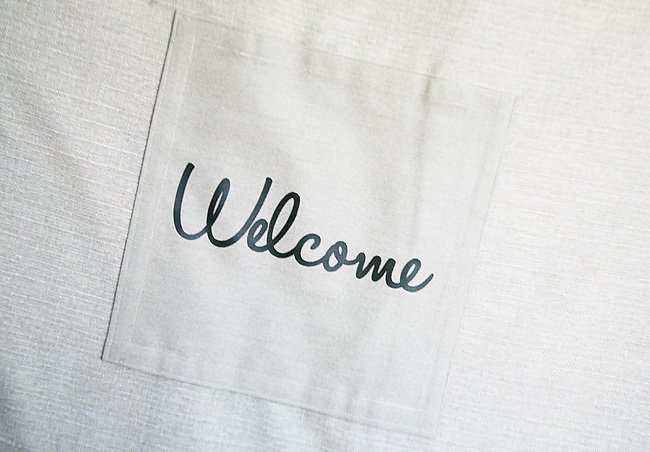 I thought about doing one with our name, but then saw they had a Welcome Patch one and decided to order that one since it would be seen right when you arrive in our home. Now here's the tricky part. I realized my stairs are uniquely designed and somewhat have an issue when installing gates. 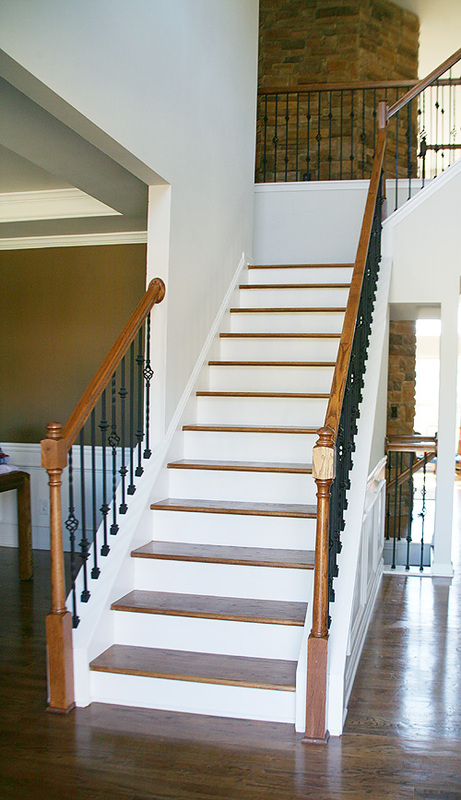 The wrought iron spindles and the placement of our baluster prevent us from installing gates correctly. 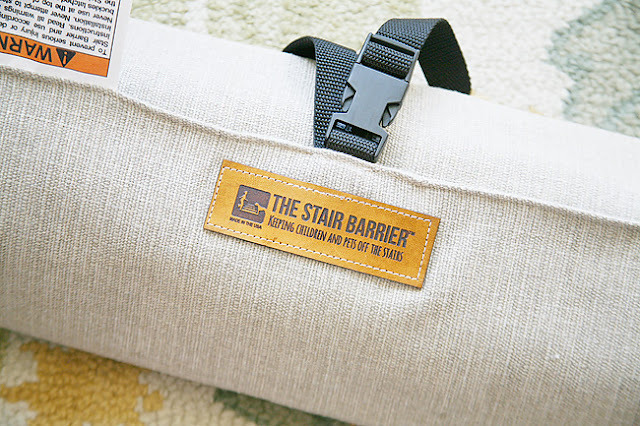 The fabric of The Stair Barrier doesn't sit flush with our stair because of this design flaw. However, the gate still works with our staircase otherwise, and Baby Cute seems quite perturbed by that. Overall the whole installation process was super easy, and with just a few clicks and a quick strap adjustment our gates were up and running. I wish all baby proofing were so easy! With The Stair Barrier being so easy to put up and take down, I can also see us taking this with us to other places where we might need a gate. Either when we travel or to grandparents homes who might not already have gates in place (especially when they only need them for an hour here or an hour there). 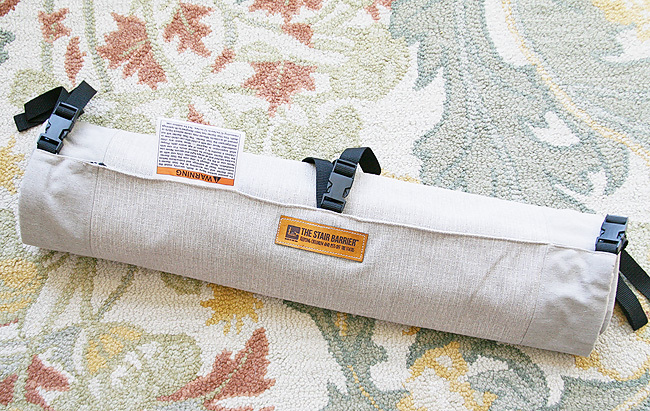 Just another quick click or two, and its all rolled up and ready to go to take with us. Our sweet Baby Cute will be protected no matter where we go! 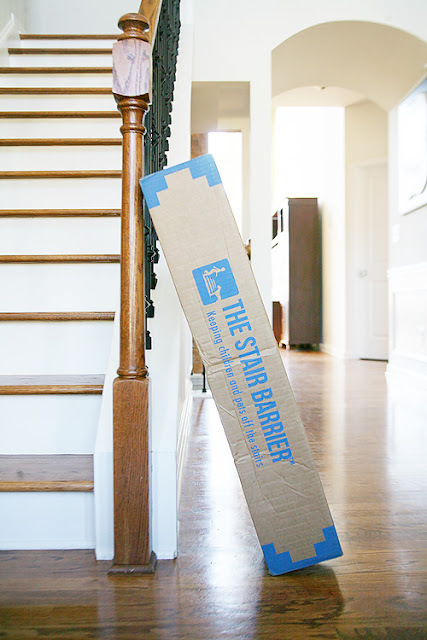 While Baby Cute's been unhappy she could no longer make the dangerous amazingly fun trek up the stairs, The Stair Barrier gate has been such a wonderful addition to our home (and our sanity), that she couldn't stay mad for long. 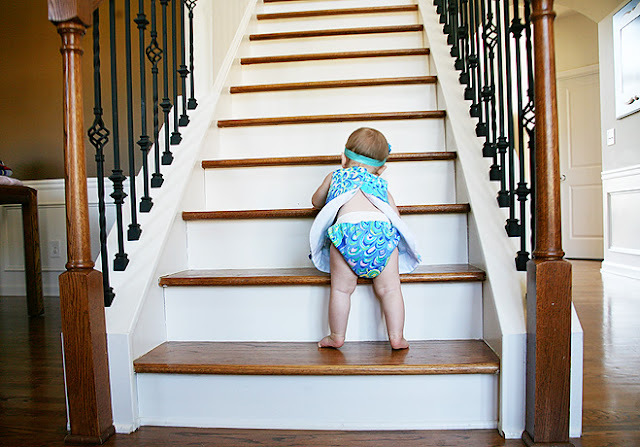 Do you have any stylish baby proofing solutions for your home? What tricks or products have you found that work best?